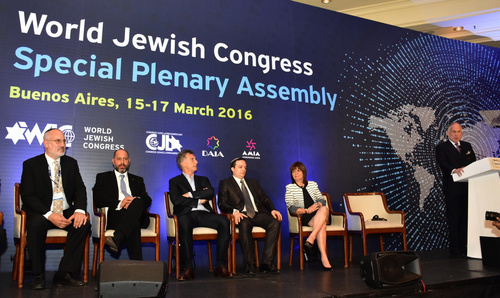 More than 400 Jewish community leaders from around the world gathered in Buenos Aires from 15-17 March, as the WJC held a special session of its Plenary Assembly, the organization’s highest decision-making body. Argentina’s President Mauricio Macri delivered a keynote speech at the opening event of the assembly, and Paraguay’s President Horacio Cartés was awarded the Latin American Jewish Congress’ Shalom Prize for his support for Israel. Macri, in his speech, said his government was "fully committed to contribute in any way we can to make headway with this investigation." In policy issues, the plenary voted unanimously to allow Lauder to stand for a third consecutive term as WJC president, as stipulated by the WJC’s constitution. In its resolutions, the WJC condemned Israel boycott movement as 'manifestation of anti-Semitism'. The WJC considers “efforts to discriminate against and delegitimize the State of Israel on university campuses, including the boycott of Israeli scholars and academicians, to be especially pernicious,” and condemns “those who deliberately seek to prevent economic, academic, and cultural cooperation, and obstructing global and Israeli and Palestinian economic opportunities. World leaders, as well as religious leaders and international organizations, should “jointly formulate an effective strategy to root out the campaign of incitement and recruitment by extremists, including through mosques and social media,” the assembly resolved.